I went to a new cafe here in Fort Myers a few weeks ago to try something new for lunch. Unfortunately, the simple signage out front was a representation of what awaited inside. A rather dull menu of sandwiches and salads that were just so-so with the exception of some interesting side dishes. I ordered a grilled chicken sandwich with the three bean side salad and was pleasantly surprised at how great the side was! If I had known better, I would have gotten a big bowl of that with some chicken on top. And so the food lessons continue, sometimes you have to order a crappy sandwich to find a little something fabulous. The cumin vinaigrette gives this succotash a little Middle Eastern flare. The smokey cumin is complemented with the sweetness of the corn and the cranberries. No matter what dish you use dried fruit in, it is very important to rehydrate the fruit in hot water before incorporating. It makes for much better texture and will prevent baked dishes from drying out. Fresh corn gives a crunch, and the lima beans provide an excellent source of fiber, protein, and potassium. Boil 1 cup of water and pour over the cranberries in a small bowl. Let sit until the cranberries have soaked in the water, about 3 minutes. Drain and set aside until cool. Remove the corn from the husks and cut the kernels off with a knife. 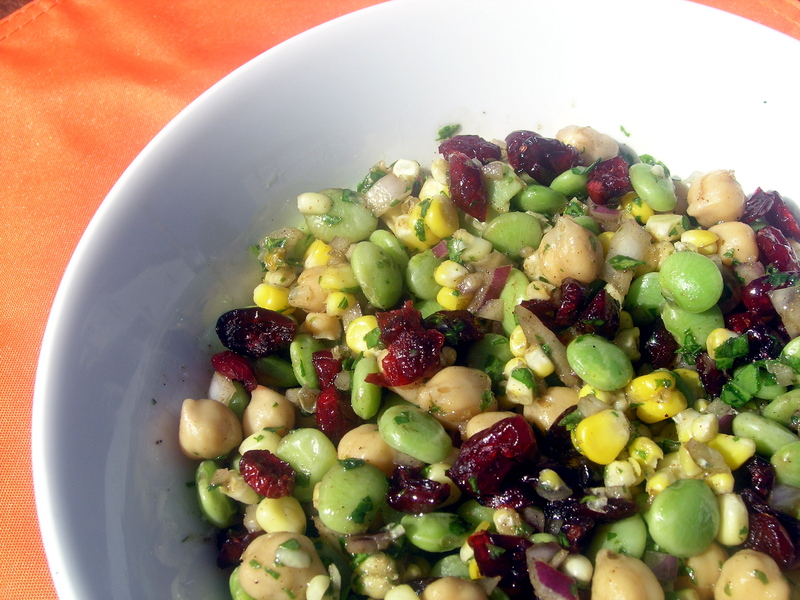 Combine the corn, lima beans, garbanzo beans, cranberries, and red onion in a medium-large bowl. To make the cumin vinaigrette, whisk together the red wine vinegar, cumin, parsley, and oregano in a small bowl. Slowly drizzle the olive oil into the bowl and whisk in until well combined. Toss the vinaigrette with the corn and bean salad. Season to taste with salt and pepper. The dish can be served at room temperature, or chilled for an hour and served cold.